The Afghan Hound is an ancient breed and can be traced back thousands of years to Afghanistan. 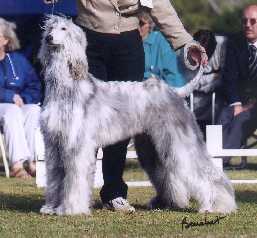 Afghans are tall, stately dogs with long silky hair which requires regular brushing. 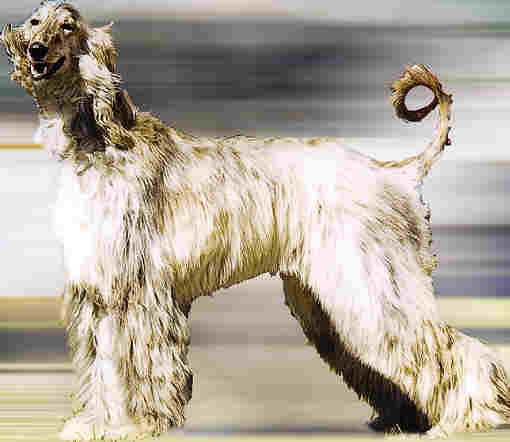 The Afghan Hound was used for hunting in rough, harsh terrain. Its long legs could speedily chase any game that the dog saw. The Afghan's speed and size make it capable of bringing down large animals like gazelle and leopard. There are two types of hounds - scent hounds, which follow a scent with their nose, and sight hounds, which follow movement with their eyes and give pursuit. An Afghan hound is a sight hound. It fixes it's eyes on its quarry and gives chase with single-mindedness. These dogs need a big yard where they can run at speed. A high fence is recommended. Afghans hesitate to befriend strangers but with their own people they are loyal and full of fun. They tend to be unfriendly towards other dogs. Large dogs need firm, consistent discipline and training. A well-groomed Afghan hound looks elegant. But when the dog has been rolling in the dirt, and the coat is tangled with grass, it looks scruffy! Never mind, the Bible says, "Man looks on the outward appearance, but God looks on the heart." 1 Samuel, chapter 16, verse 7.